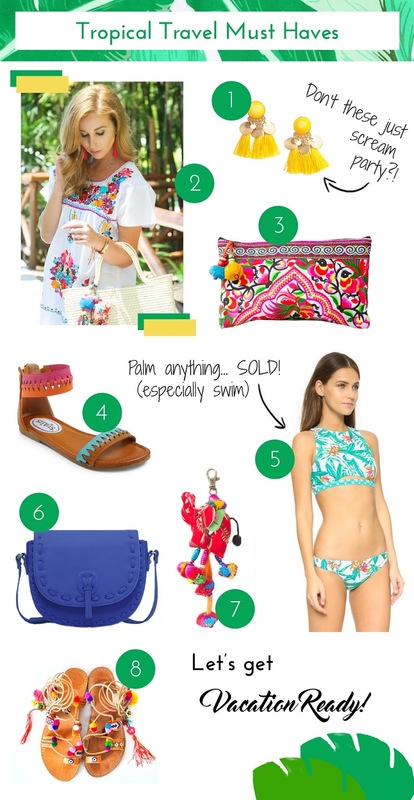 8 Items You NEED This Summer! You guys loved my Mexico trip so I figured I’d share my favorite items from the trip and other similar pieces! Ooo I love number 4. I have tons of #3's. I love a cute colorful handbag. All these things scream summer fun, love it. Those shoes are perfect, and the elephant keychain is soooo cute! I basically love anything embroidered for summer and those pom sandals are so playful and fun! I have those sandals too and I love them for summer! All so cute and colorful! I love that blue purse! The ultimate summer roundup!! I'll take one of each, please!! I really want to get an embroidered clutch. I love how colourful they are. I am in love with #3!! I love this bikini and the pretty blue bag! These are perfect finds for summer. Yes!!! I love all of these! Oh, I love it all — so perfect for summer and I totally need those sandals! Swoon! That little elephant key chain is the most adorable thing ever! This is awesome!! Hope you’ll stop by my blog for the latest post!